The Treasury is offering a 5-year TIPS Thursday that will have zero appeal for small investors. CUSIP 912828SQ4 will auction with a coupon rate of 0.125%, but buyers will have to pay up – way up – to get the likely yield to maturity of around -1.10%. That means buyers will accept 1.10% less than the rate of inflation for 5 years. At the same time, this week offers a very attractive buying opportunity, but you need to act fast. 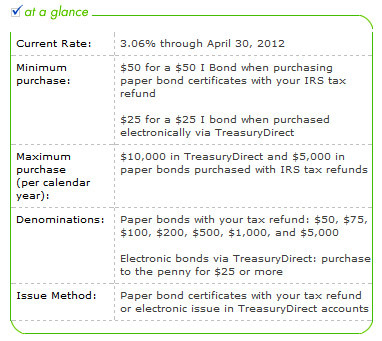 Through April 30, you can go to TreasuryDirect.gov to buy I Savings Bonds, up to an annual limit of $10,000 (or $20,000 for a couple), and get an annual rate of 3.06% for six months, and then 2.20% for the next six months. That is a combined annual interest rate of 2.63%. This assumes you won’t sell the I Bond after a year, but even if you did, and paid a three-month interest penalty, you’d get an annual return of 2.08%. The reason you need to act fast? The inflation-adjusted interest rates on I Bonds will readjust on May 1, so all I Bonds purchased after May 1 will earn 2.20% for six months. If you act before May 1, you can lock in the higher rate of 3.06% for six months, then the 2.20% rate for the next six months. Buy I Bonds up to the limit before May 1. Let me be clear: Do NOT procrastinate. There is no better super-safe investment out there. An I Bond compares directly with a 5-year TIPS, because you can sell the I Bond after five years with no penalty. Would you rather earn the rate of inflation for five years (I Bond), or the rate of inflation minus 1.1% for five years (TIPS)? Plus, I Bonds have tax advantages over TIPS, since interest isn’t reported until you sell them. With TIPS, you pay interest now, even though you don’t get all the money until maturity. One more thing … I Bonds have a dual interest rate, the base rate (currently zero) and the inflation-adjusted rate (currently 3.06%). We know the inflation-adjusted rate will drop to 2.20% on May 1, but what about the base rate? Is there any possibility it could tick up? No, it will not tick up. It will be zero. Why not buY both? Tips can go in ira. Breakeven for 5 yesr id less than 2% so a good chance of inflation being higher. Looking at a 5-year range, I think I’d prefer an insured bank CD with a rate of about 1.7%. That pushes the breakeven rate out to 2.8% or so, meaning the TIPS won’t outperform unless inflation averages more than 2.8% over five years. Ah but what about the embedded option you’re getting in the tips? Inflation is never expected when it comes, otherwise it would already be priced into tradl fixed income yields? The option has particular value given the very wide range of potential outcomes from here. Elliot, I would say the fear of inflation is very much priced into this TIPS, with a resulting yield of -1.08%. The real problem comes with a traditional Treasury paying 0.84%. As long as the traditional Treasury stays ridiculously low, short- to medium-term TIPS will continue to auction at a negative yield to inflation. In the next five years, where will inflation go? If economic expansion somehow takes off, inflation will rise quickly, and so will interest rates. But if not, then the Federal Reserve will continue to keep rates very, very low. It is market manipulation. But is this a bad TIPS auction for those who have already maxed out on I-bonds for the year? Sam, it’s not a very attractive auction. But buying TIPS and holding to maturity will never be a horrible investment. Details elude me about the “(or $20,000 for a couple)” I can’t figure out how to do this through TreasuryDirect. I understand TreasuryDirect doesn’t understand JTWROS, and so accounts are always individual accounts and securities are registered (as close to JTWROS as I can find) as “owner WITH spouse” instead of “owner AND spouse”. But even with such a registration, TreasuryDirect rejects a purchase over $10K. So I tried adding another registration “spouse WITH me”, and it didn’t like that either — if the first name isn’t me, then it has to be identified as a gift, so I mark it a gift and it still rejects, as I can’t be named as an owner in a gift. So what is the way around all of this? Buy $10K with me as owner, and buy $10K with spouse as owner (registered as a gift), giving up on the jointness? Do I need a second TreasuryDirect account, to get the “spouse WITH me” registration in spouse’s own account? Is there any better way? This baffled me also, until I eventually figured it out. TreasuryDirect is not all that clear on how to do it, that is for sure. The tax-deferred aspect of I-Bonds is an interesting difference from the regular TIPS. Buying $20K of I-Bonds instead of TIPS is almost like adding $20K to an IRA account and buying a super-TIPS in the IRA. (‘Super’ in that it doesn’t have any problem with deflation, and that the yield is better than current 5-yr or 10-yr TIPS). So its a way to turn a taxable savings account into a tax-deferred account. But even better, it’s a tax-deferred account without the RMD problem. So I can buy the I-Bonds and sit on them for up to 30 years, without being forced to liquidate a portion each year to satisfy the “minimum distribution” rules. I’m curious where they fit in the traditional “retirement withdrawal sequence”. They’re not a taxable item any longer; they’re not quite a tax-deferred item (e.g. IRA); they’re not quite a tax-free item (e.g. Roth). My guess is they fit best between the IRA accounts and Roth accounts, or possibly along beside the Roth accounts to fill the 0% tax bracket. I like the term ‘super-TIPS’ to describe I Bonds. The tax advantage is huge, plus the deflation protection is better, and they can’t pay a negative rate to inflation. That is the reason TIPS in the last 10 years had a 0.5% to 1% interest premium over I Bonds. Today that is reversed, and I Bonds have the premium, making them super-TIPS. I have I Bonds I bought in 2001 paying about 6% interest with the inflation adjustment. I won’t be selling those now, but as 2031 approaches, I will have to plan out how to redeem them so the tax burden won’t be onerous. I know this is old, but how did you come by the 2.20% inflation-adjusted rate in this article? The 2.20% was the composite rate that went into effect on May 1 2012. So if you bought in April 2012, you got the then-current composite rate of 3.06% for six months, then the new 2.20% composite rate for six months.